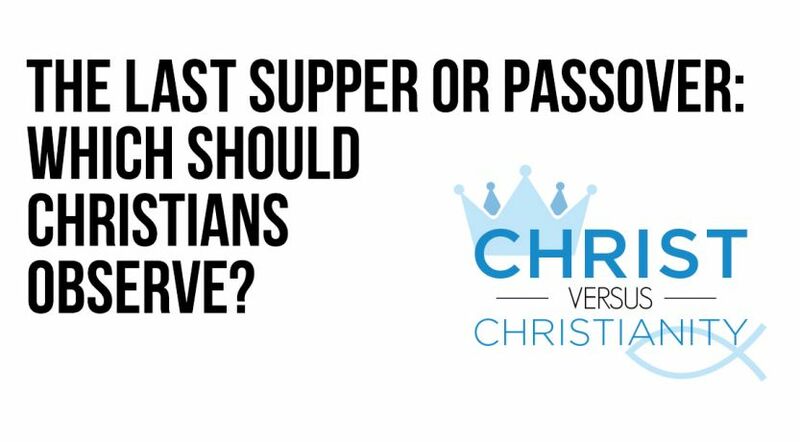 The Last Supper or Passover: Which Should Christians Observe? Jesus Christ’s last meal has caused much controversy in the Christian world. Let’s look at the New Testament to separate facts from fiction. The most well-known meal ever eaten was undoubtedly the final meal Jesus ate with His disciples before His arrest and crucifixion, commonly called “the Last Supper.” The primary sources of information on this event are found in the four Gospels accounts (Matthew 26; Mark 14; Luke 22; John 13) and Paul’s first letter to the Corinthians. It has been the topic of hundreds of artistic portrayals, but it is also the source of much controversy in the Christian world. Despite the divisions, most agree on one basic fact: It was no ordinary meal. Jesus made it clear He was establishing a new ceremony that would be practiced by His followers to remember His death. “He [Jesus] took the cup, and gave thanks, and said, ‘Take this and divide it among yourselves.’ … And He took bread, gave thanks and broke it, and gave it to them, saying, ‘This is My body which is given for you; do this in remembrance of Me’” (Luke 22:17-19, emphasis added throughout). But was Jesus establishing a completely new observance or was He building on something that had already existed? How should Christians today fulfill Jesus’ command to “do this in remembrance of Me”? Lord’s Supper, Communion or Eucharist? As already stated, nearly all agree that Jesus established a ceremony to be observed from that point onward. But Christian denominations vary widely in what they call this ceremony and how they practice it. Paul was correcting the Corinthians for selfishly eating and drinking and even getting drunk, irreverently turning it into a casual meal (verses 21-22). Paul went on to explain that the ceremony was not to be a common meal, but was to be a solemn observance focused on memorializing the death of Christ (verses 23-26, 27-29). Paul was not using the Lord’s Supper as a title, but was highlighting that what they were doing was not what God wanted. In Catholicism and Orthodoxy, the regular observance is called Holy Communion, while the actual sacrament (ceremony) is called the Eucharist. These titles are taken from two words connected with the biblical account. Communion is taken from Paul’s statement in 1 Corinthians 10:16, where he describes the wine and bread as the “communion [koinonia] of the blood of Christ … [and] the communion of the body of Christ.” But Paul wasn’t actually using the Greek word koinonia as the ceremony’s title; he was describing how Christians share the symbols as one body with Christ and each other, based on Jesus’ example of sharing the bread and wine with His disciples (Luke 22:17, 19). This word is usually translated fellowship, communicate and share throughout the New Testament. The term Eucharist is derived from the Greek word eucharistia, meaning thankfulness, related to the word used by Jesus when He gave “thanks” to the Father for the bread and wine (verses 17, 19). However, Jesus wasn’t establishing a title but was actually thanking and asking God’s blessing. So if you were given a quiz on what the biblical name of the ceremony is with these options, the correct answer would be none of the above. From then on, the Passover would become a memorial of Christ’s sacrificial death as the Lamb of God who delivers us from sin and death. Since we see no evidence in the New Testament of Jesus or the apostles formally establishing a unique new name for the ceremony, we are left with only one option for the proper name—the name Jesus used Himself: “My time is at hand; I will keep the Passover at your house with My disciples” (Matthew 26:18). The Gospels make it very clear the new symbols of bread and wine were given at the Passover (Matthew 26:19; Mark 14:12, 14, 16; Luke 22:8, 11, 13, 15). The Passover is one of God’s annual festivals to be observed at a specific time on the calendar (Leviticus 23:4-5). But that Passover marked an important transition for the observance. That evening Jesus instituted new symbolism with bread and wine. From then on, instead of only looking backward to commemorate Israel’s deliverance through the lamb’s blood on their doorposts in Egypt (Exodus 12:7, 11-12, 13-14), the Passover would become a memorial of Christ’s sacrificial death as the Lamb of God who delivers us from sin and death (John 1:29; 1 Peter 1:18-19). For Christians, it would no longer be focused on a full meal (as it was before), but would be a ceremony centered on the bread and wine. Years later, the apostle Paul reinforced the connection between Christ and the Passover: “Therefore purge out the old leaven, that you may be a new lump, since you truly are unleavened. For indeed Christ, our Passover, was sacrificed for us” (1 Corinthians 5:7). Understanding the connection between the Passover and the New Covenant symbols of bread and wine helps us determine the when of this observance. Some churches keep it daily, others weekly and some monthly or quarterly. But the Passover was, and continues to be, an annual memorial that takes place “on the same night in which He was betrayed” (1 Corinthians 11:23)—the 14th day of the first month on the Hebrew calendar (Exodus 12:2, 6). Sidebar: What Kind of Bread Should Represent Christ’s Body? Another point of division between churches is what kind of bread to use at the ceremony commemorating Christ’s death. Some churches use ordinary leavened bread, others use special wafers, and some use unleavened bread. Which is correct? Reading the Gospel accounts alone doesn’t provide us sufficient information. The Gospel writers used the Greek word artos for “bread” when describing Jesus’ final Passover. But artos is a general word that can describe any kind of bread—leavened or unleavened. So we must dig a little deeper. Going back to the original Passover command in Exodus 12 shows that God instructed the Israelites to eat the Passover lamb “with unleavened bread” (Exodus 12:8, see also verse 18). This was reinforced to the Israelites later: “They shall eat it with unleavened bread and bitter herbs” (Numbers 9:11). Since Jesus’ final Passover was prepared by His disciples, all of whom were Jews, they would have unquestionably prepared the Passover meal precisely according to the directions given in the Old Testament. That means the bread on the table, which Jesus blessed and broke, was unleavened. Since Jesus faithfully kept the law Himself, He would have had it no other way. But going even deeper, the use of unleavened bread in this ceremony actually teaches us an important spiritual lesson about Jesus Christ. In the Bible, leavened bread represents sin (Matthew 16:5-12; 1 Corinthians 5:6). Just as yeast expands within dough, sin expands through a life and ultimately destroys. Since Jesus was perfectly sinless (2 Corinthians 5:21; 1 John 3:5), His broken body is properly symbolized by unleavened bread at the Passover ceremony. Over 25 years later, the apostle Paul wrote to the Corinthians and emphasized the important connection between Christ, the Passover and unleavened bread: “Therefore purge out the old leaven, that you may be a new lump, since you truly are unleavened. For indeed Christ, our Passover, was sacrificed for us. Therefore let us keep the feast, not with old leaven, nor with the leaven of malice and wickedness, but with the unleavened bread of sincerity and truth” (1 Corinthians 5:7-8). Passover Wine or Grape Juice?